My search for good vegetarian & nonvegetarian Italian food (leaving aside 5 star Hotels) in Gurgaon ended here. A rare experience of 4 starters & maincourse coming out to be excellent back to back , followed by superb desserts. Highly recommended by YUMMRAJ. We had been to this place quite some time back when I had not yet started writing. We had good memories of the evening here. So when it came to choosing a place for eating out this weekend, we closed in on this option. We praised ourselves thruout the evening for making the right decision. The restaurant is not a very hyped up one, nor does it advertise itself much. However people who know about this place revisit. Expats often frequent this place as well. 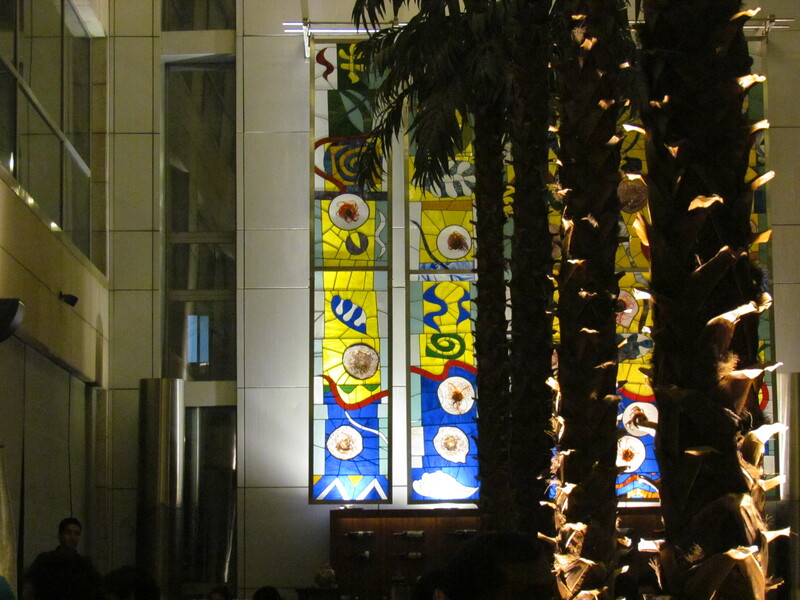 Visually the restaurant is very nice – it has a huge ceiling, full sized palms in the dining hall & beautiful interiors. The restaurant is run by an Italian Chef who himself can be seen at the dining hall talking to guests. Needless to say he does a brilliant job not just in the taste of food that is served here but also in the choice of options that are there. The menu card is pretty exhaustive – It has very well explained descriptions of the dishes that leaves little to imagination. There are many good options for the vegetarians & infact it is good for food lovers of all kinds. Unlike most other restaurants in Gurgaon, this is not a chicken heavy menu & one can expect lamb, the usual basa, sole fish etc & also salmon, tenderloin, scallops, pork, a little variety of seafood etc. Service is pretty good. The guys are well trained & pretty courteous. 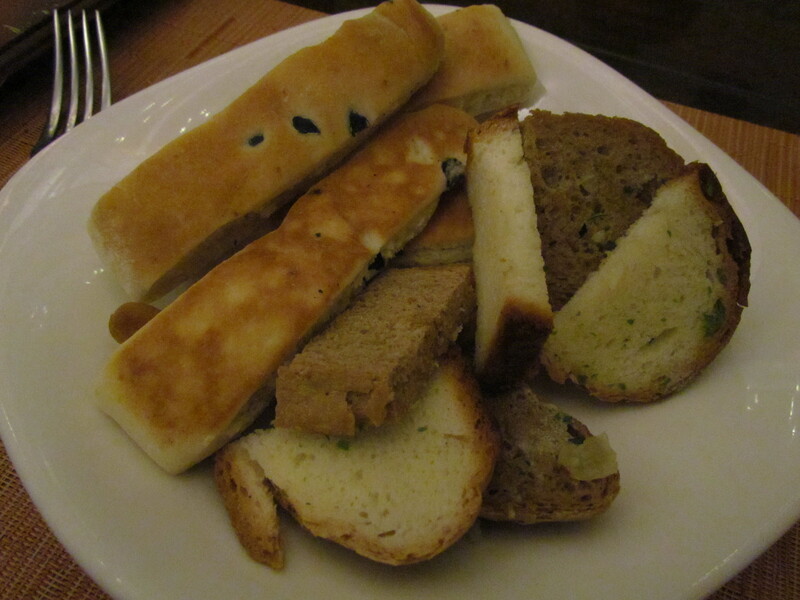 As we sat post placing orders we were served a basket of bread with delicious Tapenade. For the uninitiated, Tapenade is a Provençal dish consisting of puréed or finely chopped olives, capers, anchovies and olive oil. 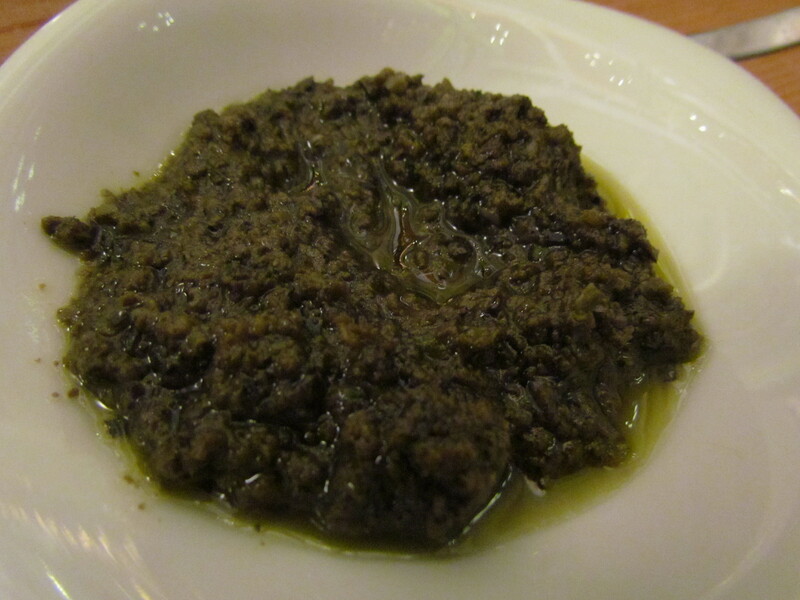 Olive-based tapenades with anchovies and/or vinegar are ubiquitous in Italian cuisine and are documented in ancient Roman cookbooks dating back thousands of years before the appearance of the French word tapenade, or indeed the French language itself. 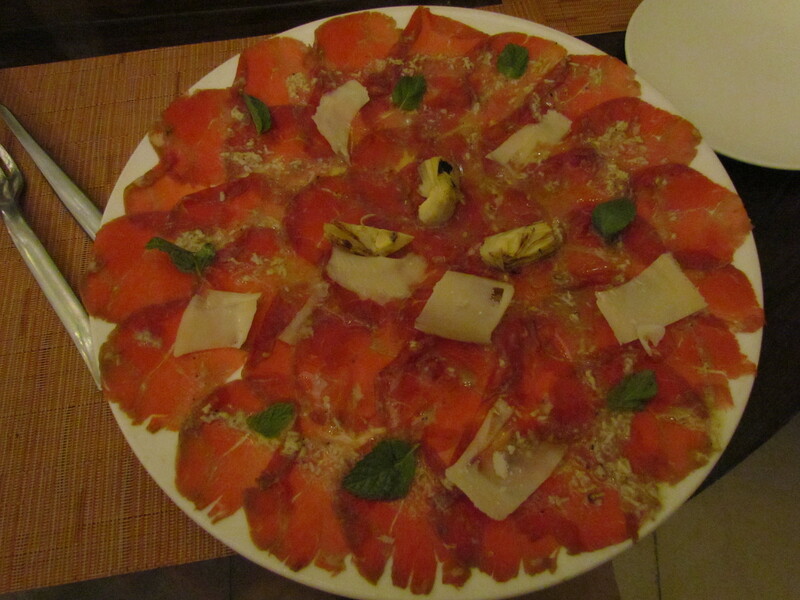 We started the dinner with carpaccio di manzo, con scaglie di parmigiano e carciofini. The guy almost fainted when he saw to Indians ordering this dish. He said ‘ but sir, this is raw beef’. I said ‘I hope it is edible’. He said ‘sure, it is but there isn’t much done to it – it is just thinly sliced beef with some top ups’. We said ‘ tHat sounds great, we will surely go for it’. Our stubbornness surely was rewarded. What came was a beautifully laid out outstanding dish. 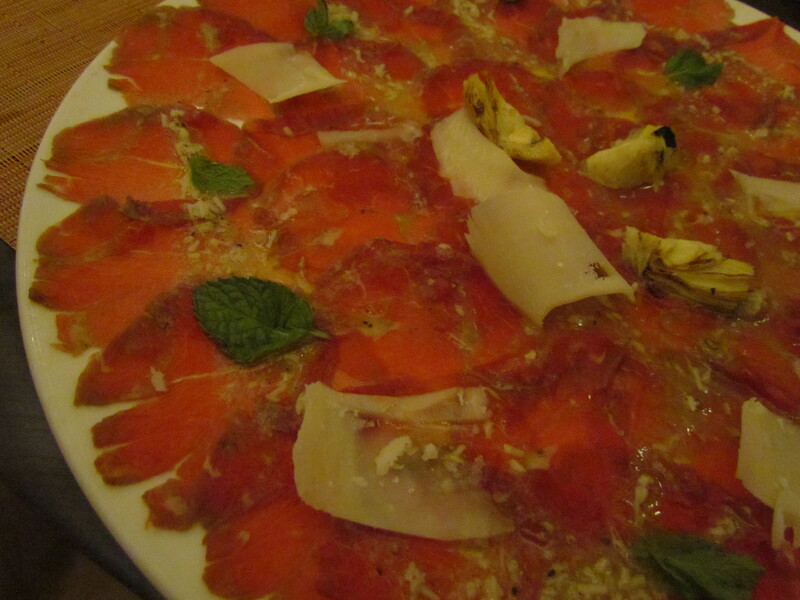 Super thin layers of raw beef, lemon, olive oil, artichoke hearts and cheese shavings on the top. Wow. After first few bites we were speechless and were just looking at each other and communicating with facial expressions. Super loved it and give it a 4.5/5. 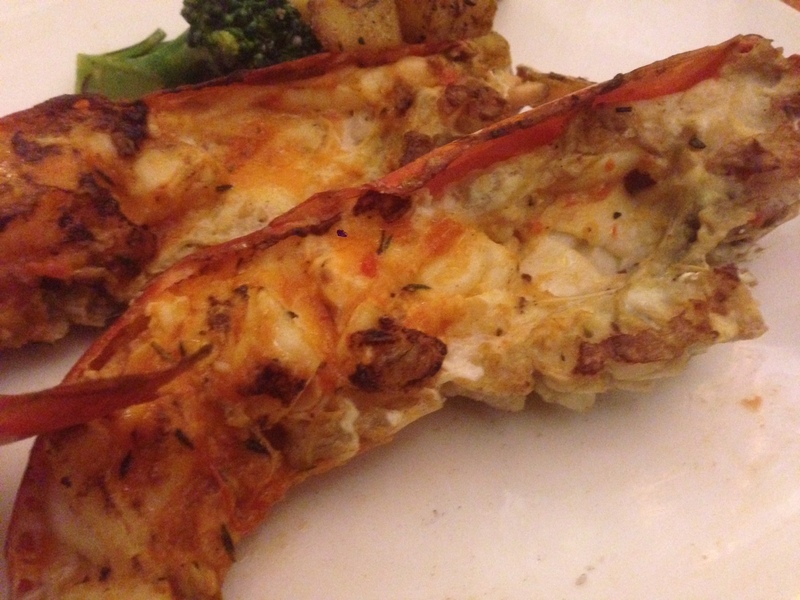 Post the awesome start, we had Scallops – Cappesiante Grigliate al parmigiano. They were just wonderful . 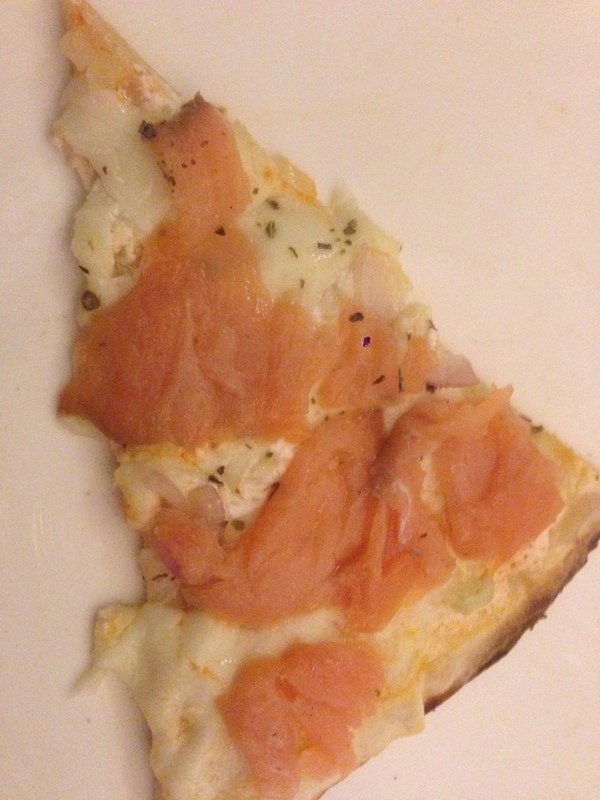 Soft, creamy, melt in the mouth, tasted just too good. The sauce was awesome as well. We finished off the sauce with fork and then wiped off the remaining sauce in the plate with small pieces of home made bread – as if the bread were roti & we were eating curry with roti. The good thing about the dish was that it let both the scallop and the sauce express themselves – none of them were overpowering. I give this dish a 4.75/5. 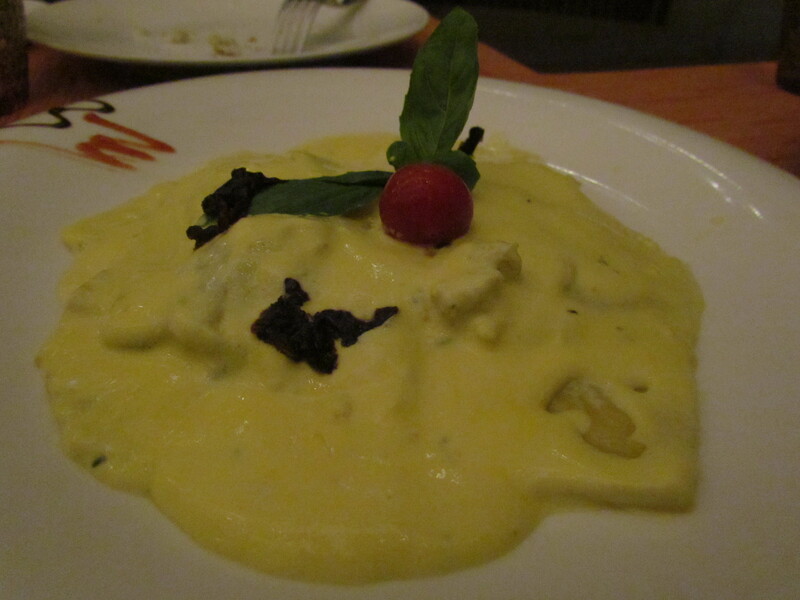 The next dish we had was prawns ravioli – Ravioli di gamberi in crema allo zafferano. Great once again. All sauces were subtle but they had a nice layered texture to them. Saffron made its presence felt. They made their presence felt – understated but confident. I give this a 4.5/5. 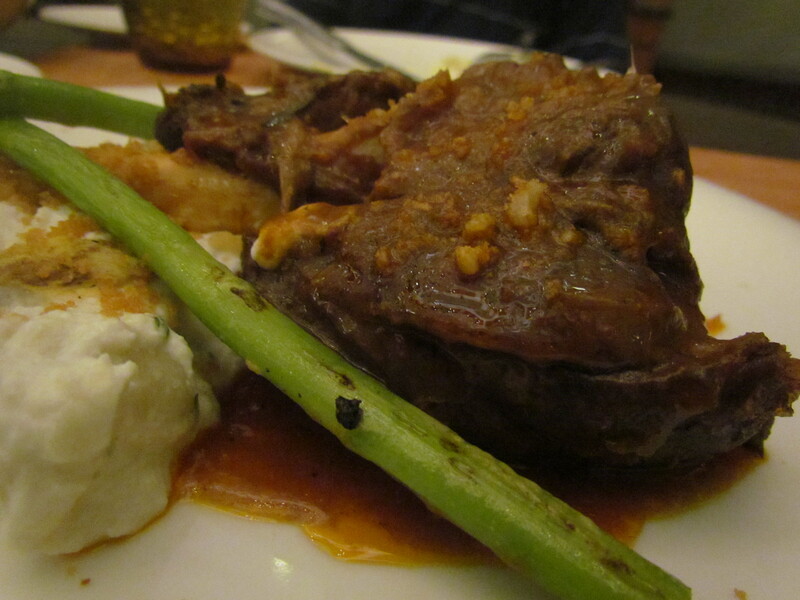 The last dish in main course was lamb – Ossobuco d’agnello, brasato al vino rosso con gnocci al formaggi. 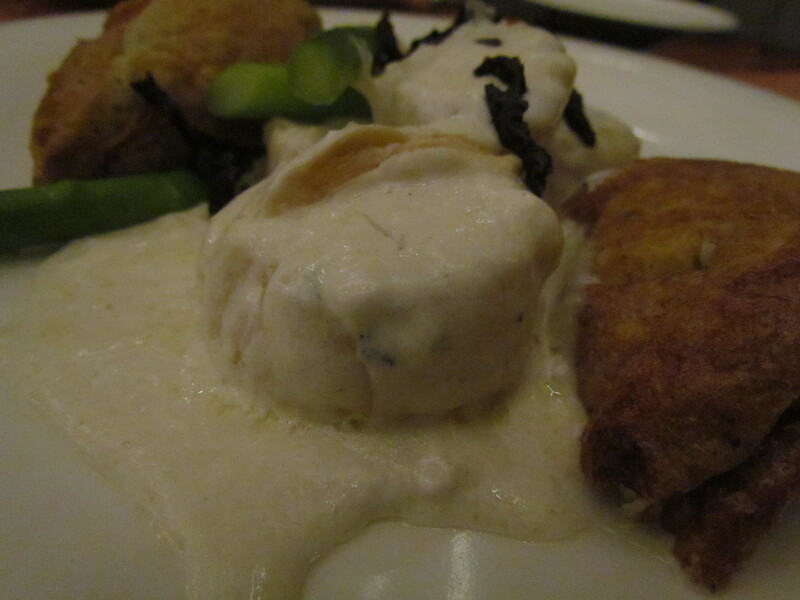 As mentioned above, it was served with potato gnocchi in cream cheese sauce & asparagus. The main dish was lamb shacks braised in red wine reduction. 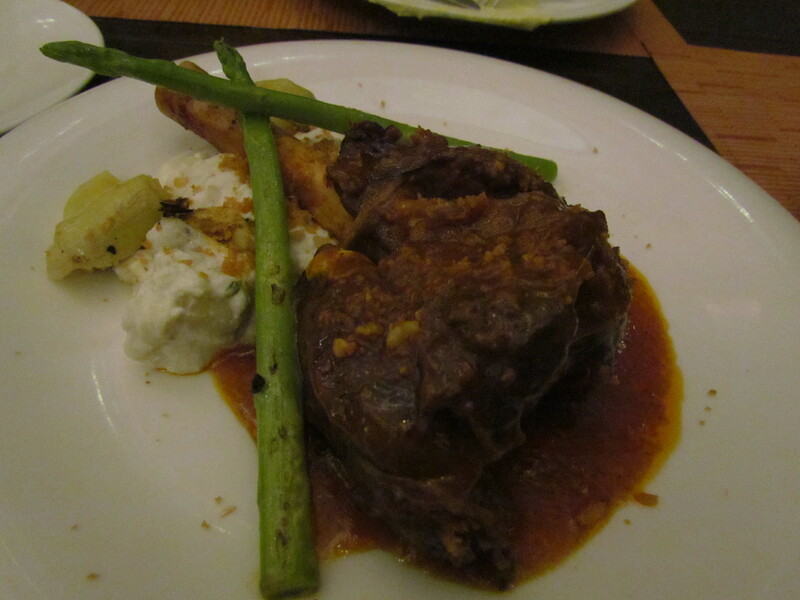 The lamb meat was intense, soft, was easily falling off from the bones but having retained a texture of its own. Awesome. The gnocchi was excellent. 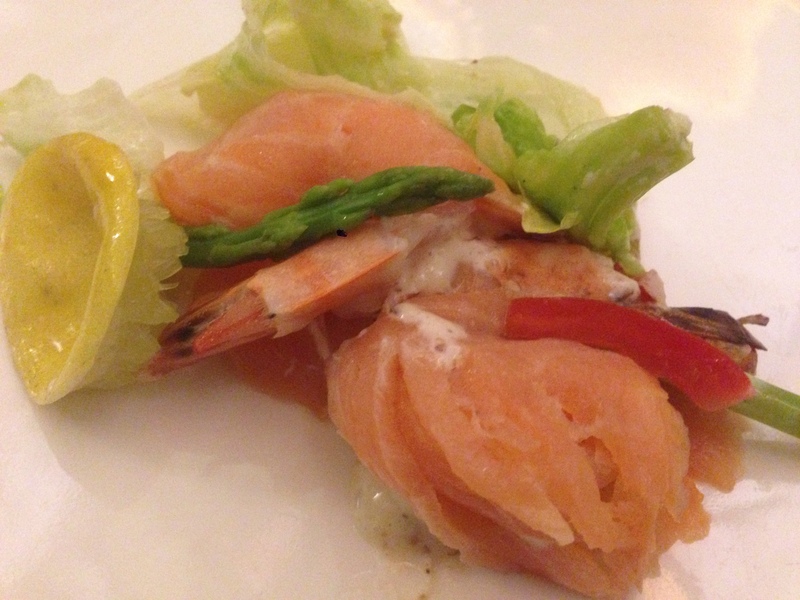 The asparagus was crunchy and non fibrous. The sauce was excellent as well. I give this a 4.75/5. I was so stunned till this time that how is it possible that all dishes r so good. So next was time to order for desserts. We decided to order one ‘ chef’s recommendation’ and another random one. 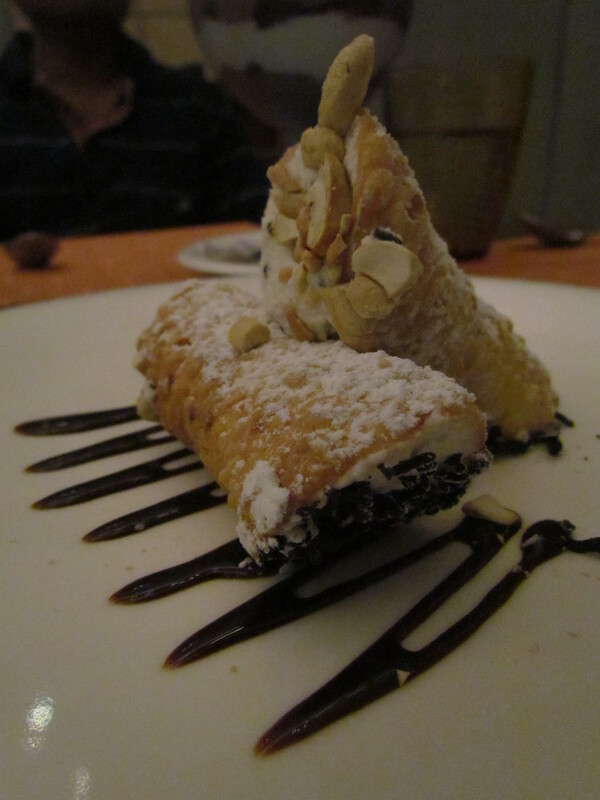 The chef’s recommendation was Cannoli alla Siciliana con ricotta mascarpone e scaglie di cioccolato. It was pastry filled with ricotta, mascarpone, candy fruit & chocolate. Sounds pretty simple, eh? Yes it was simple. However only a true master can craft such a simple dish into a wonder. The pastry was just perfectly crispy (not too much not too less moisture). It was just outstanding – very few people make it so good in Gurgaon. Needless to say that the overall combo rocked & it came out to be one of the best desserts I have had in the past few months. I give this a 4.75/5. 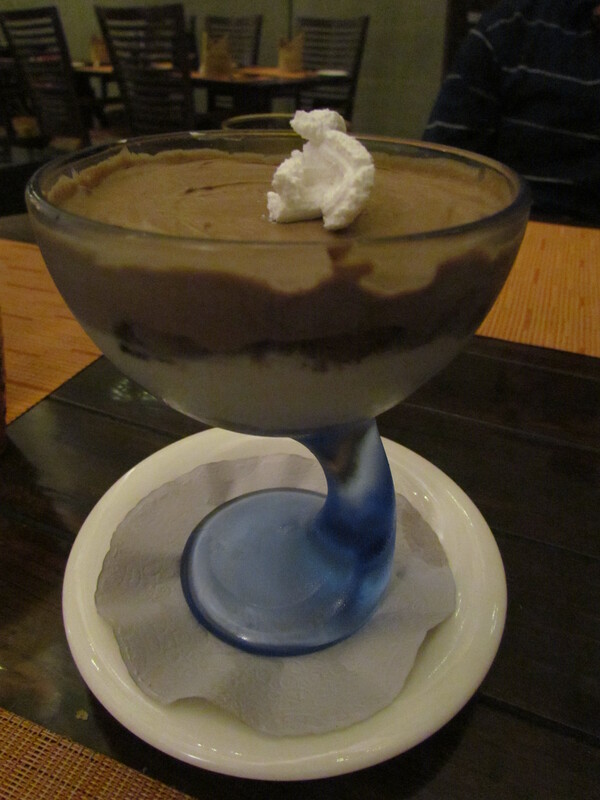 The last dessert item was Chocolate e Mascarpone Mousse – Chocolate mousse layered with mascarpone cheese & rum flavor sponge cake. This was again too good. The rum layered sponge cake was really well soaked in rum so that the flavor was there in every bite. The darkish chocolate & cheese layers were thick but ultra smooth – intense. I wud give this a 4/5. Overall rating of food at 56 adds up to 4.54/5 – A rare high rating coz all food were consistently very good. I wud revisit for sure & wud highly recommend this to all of u……………….. specially if u r an adventurous foodie. 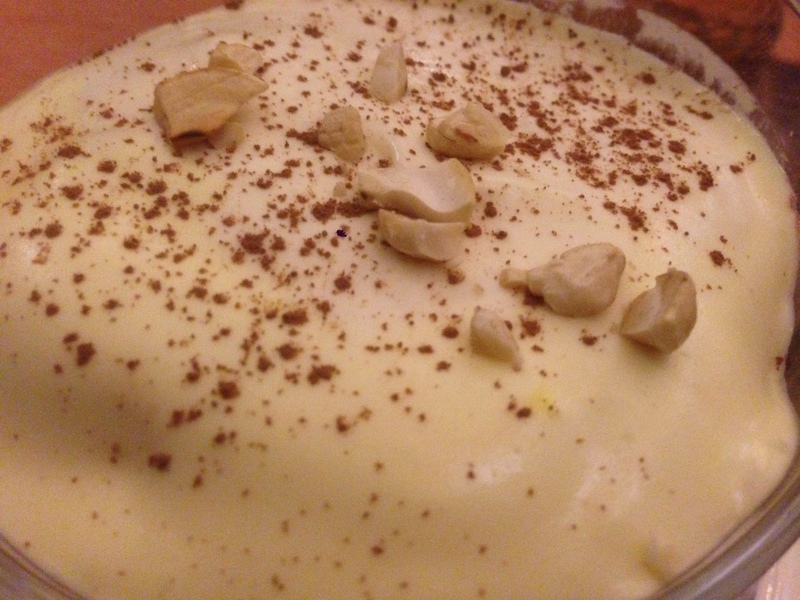 For dessert we had a mascarpone & cream based one. It was good but not as great as the amazing food stuff that we had. Rate it 3/5. I was quite fond of 56 for some time but their quality, service and attitude towards customer has gone from bad to worst in last few months. 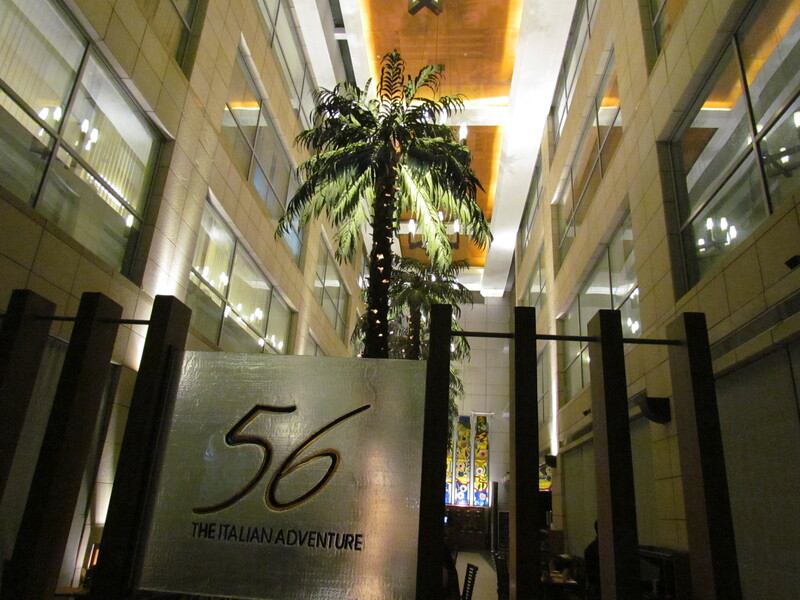 On my last visit to 56 with my family, the experience was so bad that I vowed to never return again. Hi Jatin, Thanks for writing in. pls feel free to write the full story in case u feel like. so that my readers can read about ur experience.